Abandoning old customs can be a good strategy if you’re looking to relieve stress. Experts agree that trying something new and breaking old patterns can be good. Hey, we love this idea. Maybe this year is the time to start a new tradition for you and your family. Stress is after all terrible for your health and well being. How about a stress-free Pleasure Island holiday vacation? There is still plenty of time to book a vacation. Your diet is 80% of your success or failure when it comes to losing weight and getting fit. Of course, we all struggle with this during the holiday season with parties, lots of sweets, and more food then any of us needs. So seeing how your diet is a pretty big factor in staying fit, whenever possible choose healthier choices and portions this holiday. Be mindful of what’s going on inside your body and you’ll see the results on the outside. One easy way is to choose to eliminate just one unhealthy food over the holiday. Soda, for example, is an easy target. Loaded with sugar and caffeine, eliminating these drinks are a significant step towards staying healthier. 3. 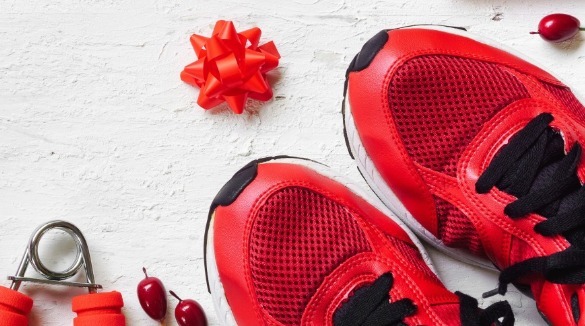 Exercise daily during the holidays. A minimum of 30-60 minutes per day is recommended to maintain a healthy lifestyle. We’re all busy and have a hard time finding extra hours in the day to squeeze in exercise, but it’s essential to a healthier and happier you. Can you get up an hour earlier? Exercise during your lunch break? Exchange an hour of television for an hour of exercise (or do both at the same time)? Take a walk after dinner each night?While many choose to set a weekly exercise goal, we challenge you to make a daily exercise goal. That’s probably a huge change for you right there, and you’re guaranteed to see and feel the benefits almost immediately. It’s also a big step toward consistency since you’re making it part of your every day. Try it! Better yet, commit to it. Constant cell phone buzzes and email alerts keep us in a perpetual fight-or-flight mode due to bursts of adrenaline. Not only is this exhausting, but it contributes to mounting stress levels, especially in women. What better time to turn your gadgets off than during a holiday get together? Enjoy spending time with your family and friends without worry. 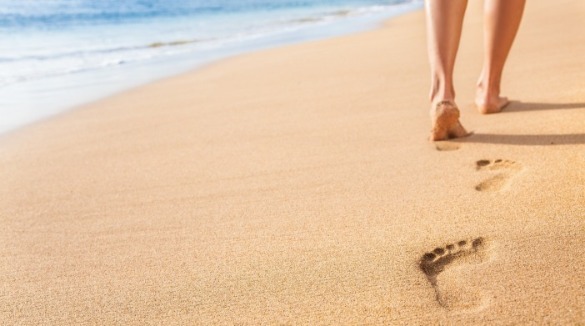 Did you know that walking barefoot on the beach is good for your health? Not only do you burn more calories walking in sand versus walking on a hard surface, but it also engages additional muscle groups. Talk about a calorie shredder. Whether you choose to go barefoot or slip on your favorite sneakers, walking on the beach is great exercise for any fitness level. From a leisurely stroll to a hard-core, heart-pumping power walk, you will love stretching your legs on the beach. Plus during the holidays a nice walk is a great way to relax and have some of that much needed alone time. Looking to increase your flexibility, gain strength, lower your blood pressure, all with a workout you can do anywhere? Well look no further than the ancient practice of Yoga. 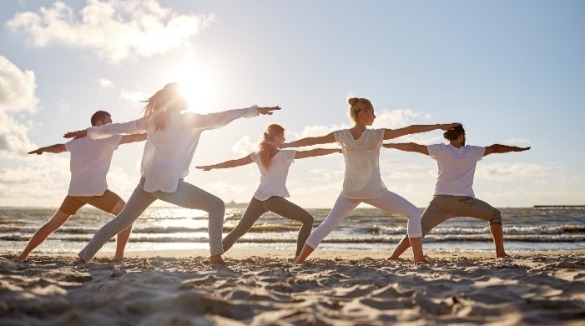 With its popularity soaring all across the United States, there are loads of Yoga studios, classes, and many community centers that offer Yoga classes. Don’t be intimidated. Yoga is a gentle and fun exercise. Almost all of the positions can be modified to assist beginners. Any age group can enjoy Yoga. All you need is a mat and a few classes to get you started. There are even great classes on YouTube. Looking for more information on the benefits of Yoga? Click here. 7. Turn on the tunes. Anxious? Listen to your favorite music, whether it’s Jingle Bell Rock or the latest from Beyonce. Research from the University of Maryland shows that hearing music you love can relax blood vessels and increase blood flow. These health benefits alone mean it’s time to break out the iPod and get your jam on. Another easy way to bring this into your holiday is to put on great music (and leave the television off). Everyone loves a house full of Christmas music. Good tunes equal good health. 8. Be human not perfect. We all want our holiday celebration to be perfect. However, we all need to stop obsessing over doing it all. The world is not going to end if the house is a little cluttered or dinner is on the table a few minutes late. Instead, spend your energy focusing on the people in your life and the joy of the gathering. Don’t sweat the small stuff and your holiday will be much more enjoyable! One of the best exercises you can do, and one that is easy for any age is cycling. Cycling is a great low impact sport that helps your cardiovascular health and builds muscle. Of course, the other great thing about cycling around the Carolina and Kure Beach is you get to take in all of the area beauty. Don’t worry about going fast. 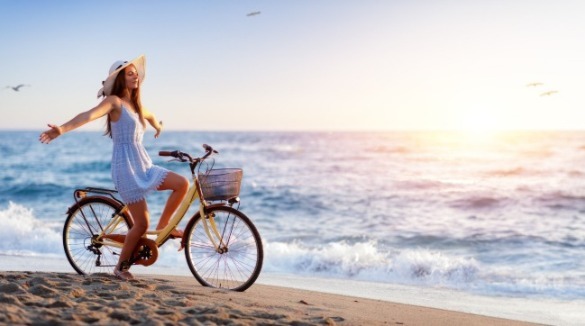 Slow and steady is perfect for biking on the beach. This exercise is easy for any level cyclist. Remember the basics of cycling safety. Always wear a helmet, and at night make sure to have a front and rear light. Remember to obey all traffic laws. Realize that you can only do so much. Many times during the holidays there are just too many things going on. Sometimes you just have to prioritize what you say yes to. Declining politely will suffice, you don’t even have to give a reason. Just say ‘no’ and stick with your decision without feeling bad. People understand that everyone is busy this time of year. 10. It’s ok to say NORealize that you can only do so much. Many times during the holidays there are just too many things going on. Sometimes you just have to prioritize what you say yes to. Declining politely will suffice, you don’t even have to give a reason. Just say ‘no’ and stick with your decision without feeling bad. People understand that everyone is busy this time of year. Looking for a different holiday experience this year? Why not try a Pleasure Island beach vacation for the Christmas or New Year holiday. There is still plenty of time to book your vacation. All you have to do is pick up the phone and BOOK DIRECT AND SAVE with Victory Beach Rentals! Don’t pay extra traveler’s fees… BOOK DIRECTLY with Victory Beach Vacations where we guarantee the lowest rates on our properties! Many outside sites charge TRAVELER’S & SERVICE FEES. Please be sure to book through our website or call our reservationists at (888) 256-4804.